Embassy Suites by Hilton Portland Downtown is located in the heart of Portland's business district and for years, served as the largest and most modern hotel in the Pacific Northwest. 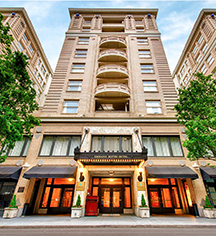 Built in a Neo-Classical style by architect Phillip Gevurtz, this grand hotel offers 276 spacious guestrooms and suites with most rooms boasting two "outside facing windows" for plenty of natural light and gorgeous city views of Downtown Portland. The hotel amenities include an indoor swimming pool, spa, and fitness room. Food and beverage outlet offerings include Mothers Bistro, an iconic Portland restaurant, and Kingsland Kitchen, a British eatery. Formerly known as The Multnomah Hotel, this historic hotel has hosted nine U.S. Presidents from Theodore Roosevelt to Richard Nixon, although President Truman was the only president to stay the night. 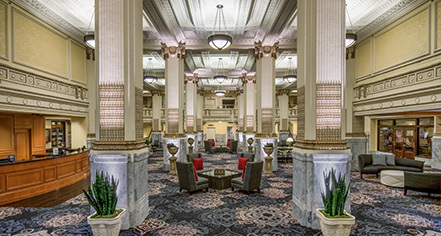 Embassy Suites by Hilton Portland Downtown, a member of Historic Hotels of America since 2016, dates back to 1912. There have been two times when a plane has taken off from the roof of the former Multnomah Hotel. Cancellation Policy: 48 hours prior to arrival, 1 night room and tax. Deposit: 1 nights room and tax plus minimum $50 deposit. Early Check-In/Late Check-Out: Early Check-In: $25.00. Early Departure Fee: $75.00. For multiple night stays there is an early departure fee of $75 plus tax. Late Check-Out Fee: $25+tax to 2pm, $50+tax to 3pm, $75+ tax to 4pm, Half Day rate up to 6pm. Hotel/Resort Fees & Taxes: Resort fee: N/A. Taxes: 14.5%. Parking: Self-parking: $42.00 (Parking Lot). Valet parking: $49.00 (Valet Parking). Secured: Available. Covered: Available. In/Out Privileges: Available. Other Parking Information: Overnight Self or Valet, 2 EVC units: Telsa and GE. Rollaways: Available upon request; $15.00. Smoking Policy: Non-smoking property. $150.00 penalty for smoking in non-smoking room. Learn more about the History of Embassy Suites by Hilton Portland Downtown .